It was his third feature, the hit supernatural thriller The Sixth Sense, that turned M. Night Shyamalan into a household name. Since then, the writer-director has seen his share of ups and downs, from the highly regarded Unbreakable to the widely derided The Last Airbender. 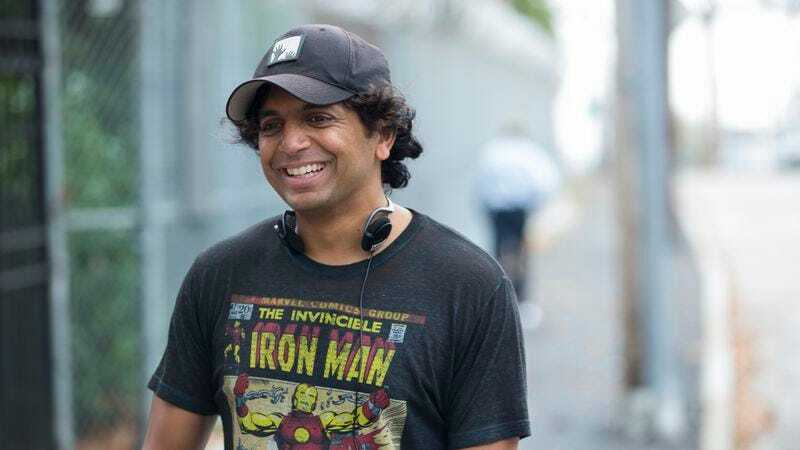 After a couple of back-to-back big-budget flops, Shyamalan decided to effectively reset his career with The Visit, his take on the found-footage horror movie. Now he’s returned with another low-budget genre film: the macabre, deviously pulpy, and very entertaining Split, an unapologetic B-movie that simultaneously finds Shyamalan returning to the territory of his most acclaimed and popular work. Explaining just how Split gets there would spoil the fun. The Witch’s Anya Taylor-Joy stars as Casey, one of three young women kidnapped by Kevin (a superbly committed James McAvoy), a working-class Philadelphian with an unusually elaborate case of dissociative identity disorder. Though previously able to lead a normal life with the help of his psychiatrist, Dr. Fletcher (Betty Buckley), Kevin has lost control to two long-suppressed alternate personalities—self-loathing neat freak Dennis and overbearing den mother Patricia—who have staged a mental coup out of a cultlike belief in an apocalyptic, previously unmanifested persona called The Beast. Shyamalan spoke with The A.V. Club the morning after Split played at last year’s AFI Fest. The A.V. Club: Your films have an obsession with home. Say, Signs—an alien invasion as a home invasion. Or The Village and The Visit. These subverted homes. You think there’s a reason for that? You write what you know. I mean, you can see, the girls who star in [Split] are 18, 19, 20 years old—my daughters’ age. When I wrote Abigail Breslin’s part in Signs, that’s how old my daughter was. They were both 5 years old. I [tried to write] how she thinks and how she dreams. You know, “Is she connected to something that I’m not aware of?” Those thoughts go through your head. MNS: …broken situations, yeah. This would be the reverse, right? What happens if the home environment is the tormentor? That’s true in both of their cases—one with the mom, the other with an uncle. If the thing that was supposed to be your strength—because you find your power from that family dynamic—is flipped, and you’re shattered by that dynamic. And you have these two people meet that can see that in each other. AVC: Okay, there’s a line in Unbreakable that’s relevant to this film: “I’m not a mistake.” Do you just think that’s an interesting idea for characters to voice? MNS: No, I believe it. I tell my kids not to label things good or bad, because you’re gonna be wrong on both counts. It is what you make of it. One time, I was giving this speech at a high school, and what I really wanted to say—which I didn’t say, of course—was, “What if, to achieve the thing you wanted to do, something earth-shattering had to happen to you?” Let’s say, for you to see things differently, for you to really have something to say, someone you loved had to die in a car accident. Would you want all your dreams to come true if you knew that had to happen? It’s something I truly believe in—that we learn about ourselves most in those times and that we become something extraordinary in those times. Specifically, in our movie, when we started talking about DID [dissociative identity disorder] patients, I didn’t want to look at them as less than us. What’s so great about us? I’m not sure “normal” is that good. AVC: Did you ever have a bad traumatic event? AVC: Please go on, because you’re validating all my theories about you. AVC: I always suspected that the dread in your films was rooted in actually being a very happy family man. You must have had a nice childhood, because who else would be so terrified of having it all fall apart? MNS: That’s true! It’s the potential loss of all that. I’m constantly going, “This can’t last, this can’t last, this can’t last.” Maybe working all of that out on paper keeps the demons away. AVC: To completely change subjects, let’s talk about your choice of cinematographer on this project. MNS: The format of doing these smaller movies and using newish people is so exciting for me. That excites me. Michael Gioulakis, “Mikey G,” who [shot] It Follows, he came and lived at my house in Philly for, like, a month. I storyboard every shot and then redo it and redo it in drafts to get the visual script. And he was down for anything. I’m very influenced by independent and foreign cinema, so we were watching a lot. In particular, Caché was a big deal for me. Dogtooth. Have you seen Dogtooth? MNS: Well, then you remember how the frame is so irreverent to the characters. They stand up, and they’re just cut off. It’s doing its own thing. So if you watch our film through “Dogtooth eyes,” you can see how often we did that: a character just standing up out of frame or walking out, or you see just their shoulder. It feels like a window. And we both went through an Altman phase. AVC: You’ve got quite a few zooms. MNS: A lot of zooms! We’ve got those ’70s zooms in there, the drifting and moving. We zoomed up a lot. Both he and I love Altman, so we were just geeking out on these amazing filmmakers. You’ve got to find a partner like that.